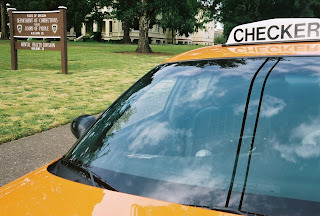 Bill Smith had been driving a cab for over 12 years, when he moved to Lincoln City, on the Oregon coast, in 2006. He decided that the daily 50 mile one way commute to Salem, to drive taxi for a 12 hour shift was getting to be too much, so he turned in his 2 week notice. Bill had procured employment as a CNA, at a convalescent home in the coastal town, so he was in his final week at Yellow cab in November 2006. Then one average night, the dispatcher gave driver number 26 an average call. When he arrived at the address, it was an apartment house. An oriental gentleman answered the door and said that he would be right out, as he picked up a bag off the floor and followed Smith out to the cab. Bill jumped out of the cab with the knife in his hand, as his passenger opened the back door, and fell out, dragging the bag behind him, and proceeded to run into the church. After getting some of the arriving people to help him, they noticed that people were beginning to run out of the church building screaming “fire, he’s lighting everything on fire!” My cab had hit somebody’s car in the parking lot, and someone had called the police by this time. The police and fire departments arrived along with the SWAT team, that climbed to the top of the church roof checking for people. After the investigation it was found that the oriental man who attacked driver number 26, and tried to set people and the church on fire by igniting a flammable liquid, which was probably gasoline, in a container in the sports bag, was convicted of murder in 1989. He drowned his 5 year old daughter in the bathtub, and was sentenced to the Oregon State Mental Institute for the criminally insane. After 5 years, it was determined that with medication, the defendant was docile and non hostile, so he was released. He discontinued taking his medication a few days prior to the incident.